When Will Power won the 102nd Indianapolis 500 on May 27, the first step in having his face sculpted on the Borg-Warner Trophy began the morning after his big win when he had photos taken of his face. Those photos are what famed sculptor William Behrends used to create a full-size soft clay image of Power’s face. On Thursday at Behrends’ art studio at his spectacular home on the hillside of the Blue Ridge Mountains in Tryon, North Carolina, Power saw the clay sculpture for the first time. This year’s Indy 500 winner for Team Penske was surprised to see his face looking back at him. “It’s a strange feeling because you aren’t used to looking at yourself in this way,” Power said. “You’re used to seeing your face reversed when you look in the mirror. Power traded in his racing uniform at Team Penske to become an art model Thursday at Behrends’ studio. As he sat in the chair, Behrends skillfully and artfully worked on the clay sculpture to put some final touches on Power’s face. This is what makes an artist an artist, and when it comes to this type of work, there are none better than Behrends. He has sculpted the face of every Indianapolis 500 winner since Arie Luyendyk in 1990. Power is the 29th face that Behrends has made for the trophy. Power won his first Indianapolis 500 driving the No. 12 Team Verizon Chevrolet to victory. It was the 17th Indianapolis 500 win for team owner Roger Penske. Behrends has made 10 of Penske’s 17 Indy 500 wins with eight drivers, more than any other team in IndyCar history. “I’m very proud to have done over half of them for Team Penske,” Behrends said. “Seventeen wins is amazing, and I’m honored to have been doing their faces on the trophy. Australia native Power is also a North Carolina driver as he lives on Lake Norman, in Troutman, North Carolina. When Behrends started making the face on the Borg-Warner Trophy in 1990, he thought he would get in trouble for making Luyendyk’s hair as long as it was at the time. “Arie had very long hair, and I decided to go with that,” Behrends said. “It was very unconventional what had been on the trophy previously. Behrends watched the Indianapolis 500 in the Borg-Warner Suite at the Indianapolis Motor Speedway. He keeps a keen eye on every driver because one of them will be someone he gets to know very well as the process of making the face on the trophy begins. “Aside from the excitement of the race, it’s really exciting for me on race day because they aren’t just drivers and competitors, these are personalities and people, some that I know,” Behrends said. “But to see a driver like Will finally win after he has been so competitive for so many years, for him to finally have all those years pay off and win the race was real exciting for me. Behrends was happy to see the reaction in Power’s face when he unveiled it. “When I saw it for the first time, it was weird looking at myself almost in real life,” Power said. “It was very cool. As Power sat in the chair, with Behrends continuing working on the details of his face, he thought the entire experience was very cool. “It’s amazing sitting here watching my face get sculpted knowing it will be on the Borg-Warner Trophy,” Power said. “To know that it was win No. 17 for Roger Penske, he was very excited, like it was the first time he won the Indy 500 with Mark Donohue in 1972. “To see Roger’s face in Victory Lane at the Indianapolis 500 is amazing. The emotions that come with winning are many, and Power experienced all of them after he won his first Indy 500. “There is no experience like the experience I had in Victory Lane there,” Power said. “The amount of cameras that were there, the bagpipes playing, and the amount of people around, there was nothing like it anywhere I’ve ever been. And the Borg-Warner Trophy is amazing in the world of sports. It has been presented in Victory Lane to the winner of the Indianapolis 500 every year since 1935. The Borg-Warner Trophy is on permanent display at the Indianapolis Motor Speedway Museum but has gone on the road recently thanks the efforts of Borg-Warner. Last year, it toured Japan with 2017 Indy 500 winner Takuma Sato. In June, the trophy went to England to the Goodwood Festival of Speed for the first time. It’s a trophy with international acclaim because it represents a race for the ages. “What really hit home after the race is when Bobby Rahal came over and said, ‘Welcome to the club,’” Power said, referring to the man who won the 1986 Indianapolis 500. “It’s an exclusive club you get in to by winning that race. “It’s a memory that lasts with you forever. “That’s why you want to win it again. It would be amazing to go back-to-back at Indy. 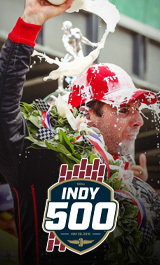 Power gets his next chance at Indianapolis 500 immortality in the 103rd Indianapolis 500 set for Sunday, May 26, 2019. On Dec. 5 at the IMS Museum, Power will get to see the finished product when the sterling-silver sculpture of his face, about the size of an egg, is officially unveiled on the Borg-Warner Trophy.